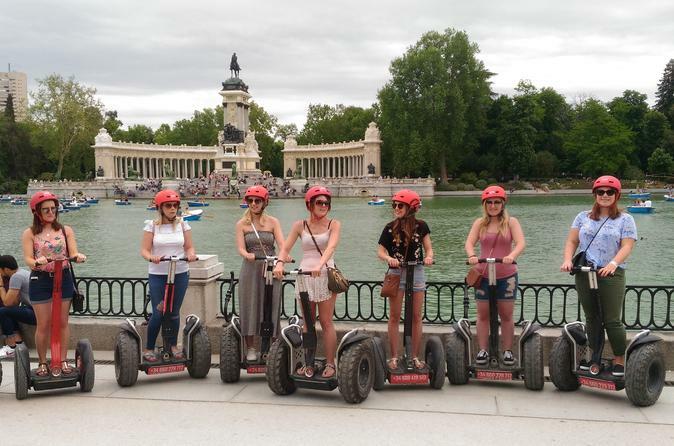 Enjoy a new way to discover the Retiro Park with a revolutionary Segway! It's not only easy, but very enterteining. When you're ready, we go on the tour to see greatest park of Madrid, "El Retiro" ! You will be able to enjoy a complete experience 100% inside the park with the segway. And you will discover all the best monuments et places of the "Madrid's Central Park" : the cristal Palace, the main lake, the garden of Cecilio Rodriguez and more ! This green oasis in the center of Madrid covers 125 hectares and is home to over 15,000 trees. From a botanical point of view, the park includes some very important gardens: the Jardín de Vivaces, the Jardines de Cecilio Rodríguez (classical gardens of an Andalusian style), the Jardines del Arquitecto Herrero Palacios, the Rose Garden, and the Parterre Francés with the oldest tree in Madrid, a bald cypress that is believed to be 400 years old. The park is not only the lung of Madrid but also offers cultural, leisure, and sports activities to the local population of Madrid and those visiting the Spanish capital. Among its architectural, historical, and popular elements are the lake for rowing, and the Velázquez and Glass palaces, both used today as exhibition halls. In addition, the retreat shelters outstanding sculptures and fountains such as: the Monument to Alfonso XII by architect Jose Grases Riera; the Reserve of Ferdinand VII, located at the corner of O’Donnell and Menendez Pelayo streets, which includes the Casa del Pescador; the artificial mountain; and the Casa del Contrabandista (formerly, Florida Park banquet hall) which confers a romantic air; the statue of the fallen angel, the only sculpture in the world representing the devil; and the Galapagos Fountain created to commemorate the birth of Isabel II.